JOHOR BARU: Floodwaters have cut off communications in several towns in Johor, Negri Sembilan, Malacca, Pahang and Sabah while nearly 40,000 people were evacuated to relief centres. So far three people were killed – two were swept away by strong currents while one fell into a pool. Another person is missing. Thousands of commuters going back to their hometowns for the Chinese New Year holidays were disrupted by floods on trunk roads and a section of the North-South Expressway. KTM Berhad was forced to cancel several intercity train services in Negri Sembilan and Johor. Rohani Ismail, 51, was killed when the car she was driving was swept away by floodwaters from an oil palm plantation in Cha’ah, Johor at about 7pm. Aw Yoke Lin, 53, from Taman Pelangi was killed when her four-wheel drive vehicle was swept into a river at Kampung Rahmat, Kulaijaya. Some 1,426 people from 342 families have been evacuated from their homes in Kulai and have taken refuge at 11 relief centres. “For the time being, there are sufficient supplies of food, medical aid and shelter for affected residents,” said Kulai MP Tan Sri Ong Ka Ting, adding the situation there was under control. In Malacca, rescuers recovered the body of security guard Yusry Mohd Yusof, 40, after he fell into a water treatment plant pool at 10am in Kampung Chinchin, Jasin. In Sabah, farmer Meriting Andi, 52, went missing as he waded a swollen Sungai Samparita in Kota Marudu to rescue his stranded children on the other side of the river bank. 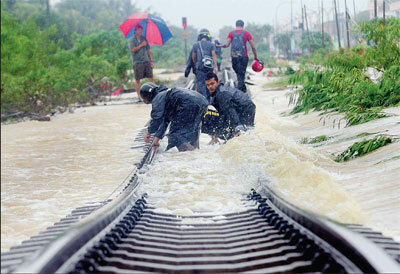 The Prime Minister is expected to visit the flood-prone areas in Johor today. 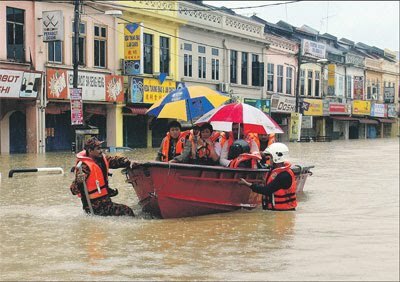 A total of 29,294 people were evacuated in Johor and were housed in 200 relief centres as at 4pm yesterday, in a repeat of major floods which occurred in 2006. 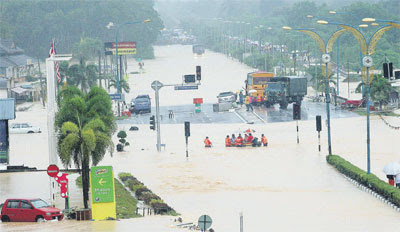 Segamat has become an “island” after it was cut off by floodwaters. 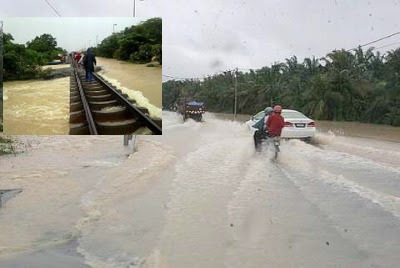 Police said no one can get in or out of Segamat as the roads to Muar, Johor Baru and Kuala Lumpur are under water. A Ledang flood operations centre spokesman said four roads – Jalan Sialang-Tangkak, Jalan Gementah-Segamat, Jalan Simpang Bekoh and a stretch of the North-South Ex­­pressway near Km173 are only accessible to heavy vehicles. Flash floods were also reported in Lahad Datu, Beluran and certain areas of Pitas, while many rural roads including those in plantations have been cut off by floods, making it difficult for vegetable farmers to send their produce to the main towns. There are one youtube link posted by thestaronline, which title name "Man-made preparation is no match to the force of nature when rain-driven floods rendered media personnel and residents becoming flood victims during and after the Tenang by-elections in Johor." Lastly, Pls, we all praying together and hope our Johor frens, relative, malaysian can survive and safely move into Chinese New Year. For the car owner in flood area. An insurance against flood is advisable to protect your most valuable asset for flood cover.